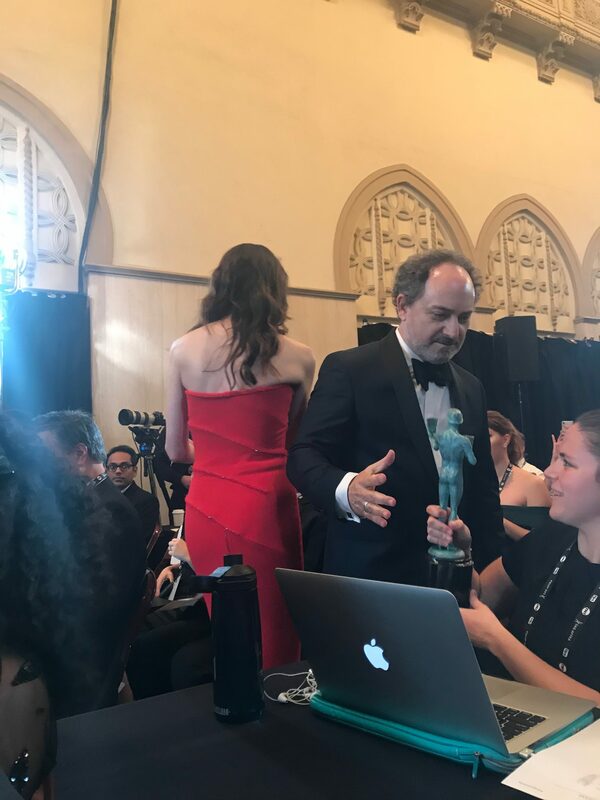 In an Awards Daily first, we got to cover the very special 25th Anniversary of the Screen Actors Guild Awards from the press room. The first actor award was presented to Outstanding Performance by a Male Actor in a Comedy Series: Tony Shalhoub from The Marvelous Mrs. Maisel. The show would go on to win two more awards and sweep for Outstanding Performance by a Female Actor in a Comedy Series went to Rachel Brosnahan and Outstanding Performance by an Ensemble in a Comedy Series. Soon after, the cast came into the press room. Kevin Pollak and Marin Hinkle walked in commenting on how heavy the trophy was and walked around the room letting journalists “Feel the weight” Pollack said. I got to feel his SAG Award and yes, it is heavy. Mahershala Ali who is on a Supporting Actor winning streak for Green Book took the Screen Actors Guild Award. Ali took to the podium to him and answered questions about the historical accuracy of the film. “Dr. Shirley was the best opportunity that had ever come my way. At that point, coming off of Moonlight was an amazing experience, but I’m present in that movie for only in the first third of it. That had been my largest and most profound experience.” He went on to say, “To be presented Green Book and Doctor Shirley, a three dimensional character with his own agency…for him to be the person of power, for him to be as talented and emotional as he was, his own personal struggle to keep his life private because for those things to be public, he wouldn’t have been embraced.” He added, “I think some of the things that are questioned can be answered by just listening to Dr. Shirley.” Ali said referring to the audio tapes that had been released the other day. A major surprise of the evening was when Emily Blunt won Outstanding Performance by a Female Actor in a Supporting Role for A Quiet Place. Blunt came in gushing, pleasantly delighted with her win. The biggest applause of the evening happened when the cast of Black Panther walked in. Yes, they came and they won and they have a Best Picture nomination at the Academy Awards, shattering records and continuing to make history. And with that, it was a wrap. The full list of SAG Awards Winners can be found here.